S T A R T H E R E 2 0 1 8 10 the enterprise. Gather the business' key information: its legal business name and address, Federal Identification Number, type of entity—sole proprietor, limited liability company, sub-chapter S-corporation, to name the most common ones—and principal owner(s) and/or partners. Next, write a few sentences describing what the company does/ hopes to do—such as "retail and wholesale sales of graphics that are produced on the premises"—and include some of its business goals. Its objectives may include things like target market share, profitability goals and major expansion plans. If you feel the urge to pontificate, share the company mission or vision statement, key factors to success, core competencies, and its unique value proposition. 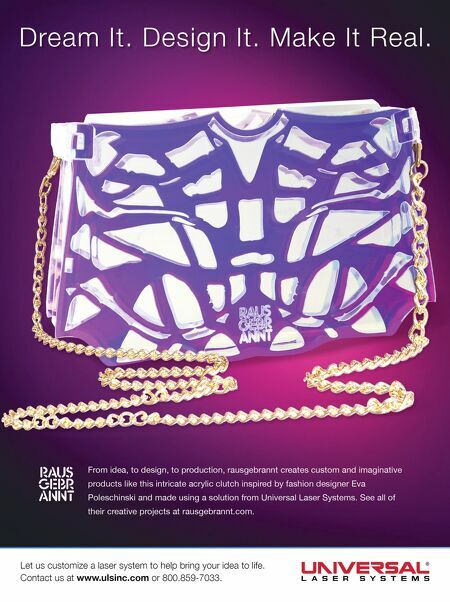 For example, General Electric's tagline is, "We bring good things to life." There's no reason your company can't stake its own claim to fame with a catchy and memorable tagline. Making Dreams Come True At this point, you can afford to play a little "what if." What if we were able to reduce our cost of goods sold? What if I decided to hire more salaried sales or customer service people, thus rais- ing my fixed costs (aka overhead)? What if I raised my prices to compensate for an anticipated rise in material and labor costs? What if we took a more aggressive position with competitively held accounts and new market segments? All of this speculation could have you chasing your tail if you try to make more than a handful of significant changes in the way you operate… all at the same time. Sometimes, these changes are unavoidable, but you should try to make calculated changes to achieve controlled growth. Richard Gerson provides an excellent reference to develop the components of a sound business plan in his book, Marketing Strategies for Small Businesses. He uses the term Marketing Plan for what I would consider, in this case, a euphemism for a business plan. The plan has four major sections—market analysis, strategy development, marketing campaign and promotion plan implemen- tation, and program evaluation and follow-up. In one example, he boils the plan down to one page by addressing 10 key areas. As somewhat of a checklist, you may include short sections describing how you will accomplish what you've set out to do. Those key areas may include a discussion on your ideal customers' strongest unmet needs, target market needs and trends, an analysis of the graphics industry in general, and your competitive edge, which covers a comparison of your value proposition against those of your competitors. 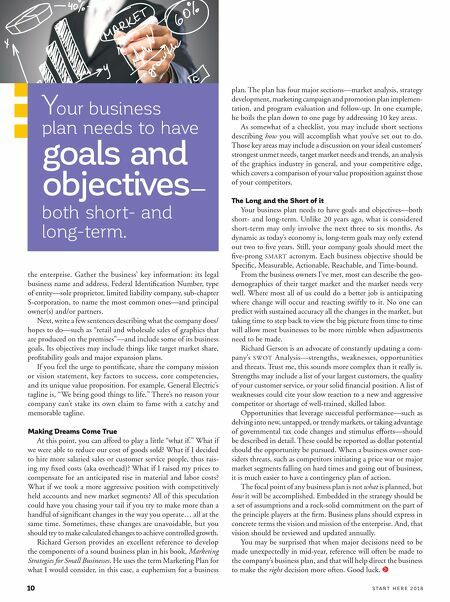 The Long and the Short of it Your business plan needs to have goals and objectives—both short- and long-term. Unlike 20 years ago, what is considered short-term may only involve the next three to six months. As dynamic as today's economy is, long-term goals may only extend out two to five years. Still, your company goals should meet the five-prong SMART acronym. Each business objective should be Specific, Measurable, Actionable, Reachable, and Time-bound. From the business owners I've met, most can describe the geo- demographics of their target market and the market needs very well. Where most all of us could do a better job is anticipating where change will occur and reacting swiftly to it. No one can predict with sustained accuracy all the changes in the market, but taking time to step back to view the big picture from time to time will allow most businesses to be more nimble when adjustments need to be made. Richard Gerson is an advocate of constantly updating a com- pany's SWOT Analysis—strengths, weaknesses, opportunities and threats. Trust me, this sounds more complex than it really is. Strengths may include a list of your largest customers, the quality of your customer service, or your solid financial position. A list of weaknesses could cite your slow reaction to a new and aggressive competitor or shortage of well-trained, skilled labor. Opportunities that leverage successful performance—such as delving into new, untapped, or trendy markets, or taking advantage of governmental tax code changes and stimulus efforts—should be described in detail. These could be reported as dollar potential should the opportunity be pursued. When a business owner con- siders threats, such as competitors initiating a price war or major market segments falling on hard times and going out of business, it is much easier to have a contingency plan of action. The focal point of any business plan is not what is planned, but how it will be accomplished. Embedded in the strategy should be a set of assumptions and a rock-solid commitment on the part of the principle players at the firm. Business plans should express in concrete terms the vision and mission of the enterprise. And, that vision should be reviewed and updated annually. You may be surprised that when major decisions need to be made unexpectedly in mid-year, reference will often be made to the company's business plan, and that will help direct the business to make the right decision more often. Good luck. Your business plan needs to have goals and objectives— both short- and long-term.